Crimson Trace is expanding their line of GREEN Laserguard’s very soon to include two new products. The LG-469G will fit the Springfield Armory XD-S and the LG-443 will fit the Glock Model 43. 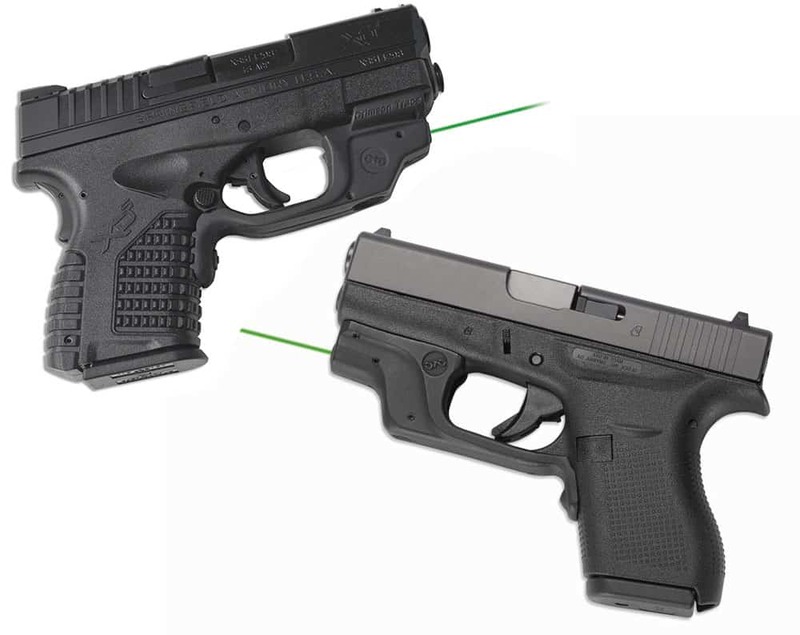 If you have either of these handguns, these are a great addition to upgrade them to. Just remember that you will likely need to get a new holster that will fit each handgun with the new Laserguard. Both Laserguards will retail for $299 or $309 for a package that includes a fitted pocket holster. (Wilsonville, OR)– Crimson Trace will soon ship the company’s newest GREEN Laserguard® products—the LG-469G for Springfield Armory’s XD-S pistol and the LG-443G for Glock’s Model 43 pistol. These Laserguards® continue Crimson Trace’s industry leading design of innovative products that provide the user with a laser sighting accessory that has a “compact, sleek, from the factory” appearance. These cutting-edge laser sights are also easy to operate thanks to Crimson Trace’s proprietary Instinctive Activation™ system where holding the handgun naturally causes activation. No special buttons or special holster is required to operate the sighting system. Among the many features of the new compact and lightweight Laserguards (both LG-469G and LG-443G) are: a master on/off switch, windage and elevation adjustment screws and a brilliant Crimson Trace green laser diode powered by a 1/3N 3V lithium battery. The LG-469G securely attaches along the Springfield Armory XD-S pistol’s trigger guard and onto the rail slots on the forward section of the pistol’s frame. The Laserguard LG-443G follows the same design and provides a streamlined fit for secure attachment to GLOCK’s Model 43 pistol. The green LG-469G Laserguard carries an affordable $299 Manufacturer Suggested Retail Price. The unit will also be offered as a special package with a fitted pocket holster and a MSRP of $309. The LG-443G Green diode Laserguard has a MSRP of $299. An identical laser sight with a red laser diode—the LG-443—is available with an MSRP of only $229. The LG-443 series of laser sights serve double duty by fitting onto GLOCK’s Model 42 and 43 pistols. Crimson Trace offers nearly a dozen laser sight and light products for Springfield Armory’s XD series pistols. Some of the products, such as the LG-469 red Laserguard, are available with a Crimson Trace holster and other products, such as the LG-487 Lasergrips® with red diode, will permit the continued use of standard holsters. Crimson Trace offers the industry’s leading assortment of green laser options, more than all other competitors combined. Overall, the company offers nearly 200 products with red or green laser diodes and bright white lights. Crimson Trace is widely recognized as the world’s leader in elevating laser sighting systems to standard equipment on concealed-carry and personal defense firearms. The company supplies products to military and law enforcement units around the globe. For more details on products or about the first two decades of Crimson Trace product innovations, visit www.conditioncrimson.com or call 800-442-2406. All Crimson Trace products are Proudly American. Crimson Trace—based in Wilsonville, Oregon—is the acknowledged industry leader for laser sighting systems. The company’s many innovations, include: Lasergrips®, Laserguard® and Lightguard™ — all with Instinctive Activation ™– plus the Defender Series™, Rail Master® and Rail Master Pros®. These products are engineered and manufactured in the USA. To reach Crimson Trace, visit www.crimsontrace.com or call 800-442-2406.